2 We need an intervention. I'm talking about references. I would like to remind everyone that there are only so many things in the universe and some ideas are bound to be repeated. The Bee Hive a reference to Terraria? In what way? No. Be reasonable. Unless you're really sure about something being a direct allusion to something else, I request you abstain from adding your half-baked reference to the trivia. I keep checking the guns section to get clues of which owned gun is best to use vrs a boss, what I'm really missing is a dps column, how much dmg would the weapon do if I continually used it properly (be it holding down a fast firing or fast clicking something else). I wish there was that dps table column in guns, and that it was sortable like the other columns. Including / excluding additional projectiles damage (Scrambler for example). As much as I'd like to see a DPS column too, I don't really think it's possible. There are too many guns with odd features. There are charged guns, guns that fire faster after dodgerolling, and then there are guns like the Bullet, which I don't even know how you would quantify a DPS for. Yes, there are a lot of straightforward guns that could have DPS values, but the table would be so incomplete due to the oddballs that it wouldn't be much help. Here is the equation for the more simple guns. Use it how you will. 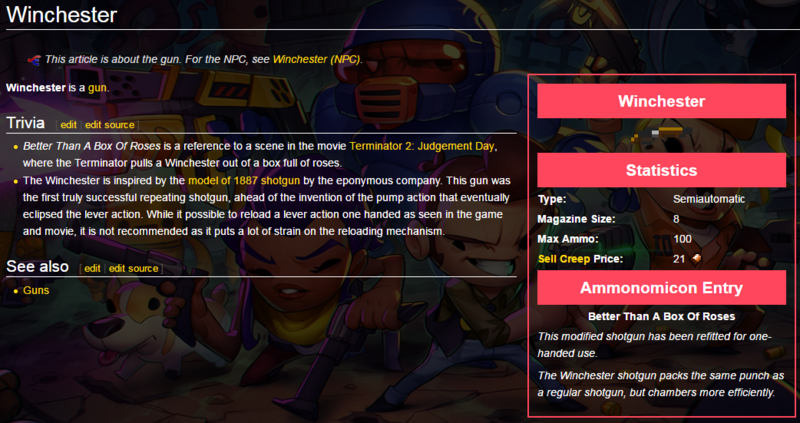 I've noticed that there's a large amount of guns with little information on their dedicated page (example), even though in the guns section the information is all there. It's a pretty time consuming process to update them so help would be very much appreciated. As the title says. New boss in the form of the Mine Flayer, so maybe the Drunkard has something new to say about it? Hi, I would like to make a French translation of this Wiki, can you tell me how can I do that ? Shouldn't the second Dodge Roll link link to Dodge Roll (Move) instead of Dodge Roll? This page was last edited on 6 October 2018, at 18:13.